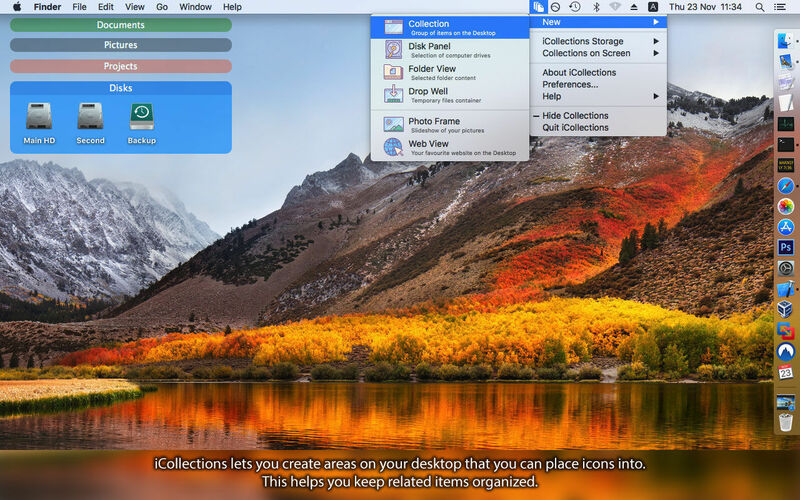 iCollections 4.7.3 – Organize your desktop icons. iCollections is an expertly designed application which helps you keep your desktop organized. The app’s unique features are what make it one of the most popular methods of desktop organization for Mac users. iCollections lets you create areas on your desktop so you can sort and arrange your icons. This helps you keep related items together so your files (pictures, documents, screenshot, applications, etc.) are organized and easy to find. iCollections fully supports Retina display. iCollections lets users see their images – even in slideshow form – right on their desktop. Each Collection and Photo Frame can be customized, including style and color, to suit the user’s preferences, offering a fun, personalized way for Mac users to make their desktop more of their own. Select Photo Frame from the main menu to create a picture frame on the desktop. The Photo Frame will display a collection of your pictures as a slide show (e.g., new picture every day). Just select your pictures folder or Photoshop app album and revisit your most wonderful moments. Not only does iCollections offer a way to vibrantly store files and folders on the desktop, but it also offers a way to increase task and time management effectiveness by offering a streamlined desktop where everything is ultra-organized. Next story FSNotes 2.6.0 – Note manager. Previous story iFunia Media Player 3.3.0 – A totally FREE video player. iCollections 3.7 – Organize your desktop icons. DwellClick 2.1.1 – Control your Mac with Mouse movements only. UnDistracted 1.76 – Turn off everything that distracts you.